The photo below shows the Nile River at night from the outstanding perspective of astronaut Scott Kelly aboard the International Space Station (ISS). Shared on Twitter for Kelly’s Year In Space photo project, there’s a perfect view of the river glowing as it flows from its source in Burundi (upper right) down toward the collection of light in the center, and past to the Mediterranean Sea. The knots of perky light show where there is high population density with the brightest seen here being Cairo and Nile Delta. The River Nile is the longest river in the world, measuring almost 6,650 kilometers long (4,132 miles). Though it is thoroughly linked with Egypt, the river also flows through Burundi, Ethiopia, Uganda and Sudan. 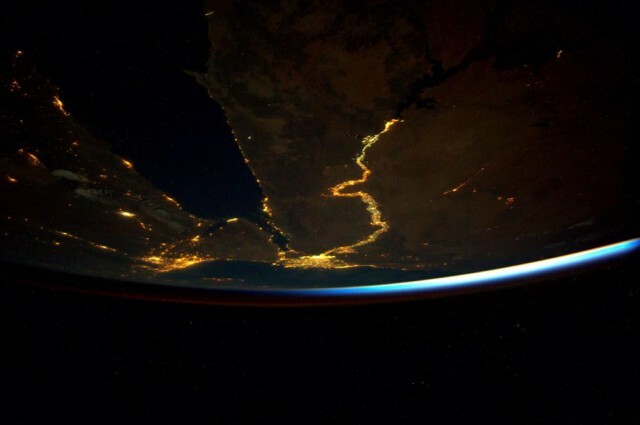 Image credit: The River Nile in Africa, as seen from space. Station Commander Scott Kelly/Twitter. Scott Kelly is undertaking a year-long mission on ISS, which started in March this year. He frequently posts photos of Earth from his exceptional point of view on Twitter.